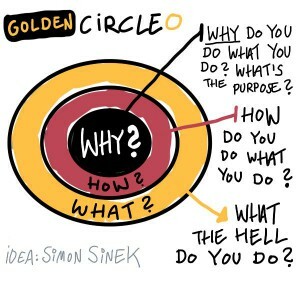 If, like me, you are a fan of Sim on Sinek’s book Start with Why and his idea of the Golden Circle, you will be familiar with the concept of understanding your Why. If you aren’t, then check out Simon’s hugely popular Ted talk or his Start with Why website. I have been using Simon’s online course just recently to work on my Why and have got it nailed down, or something close to it. It’s a work in progress and always will be but it’s good enough to start working with and use as a guide for my actions. I have shared it with a few people and the response has been somewhat underwhelming. It’s mostly been along the lines of “Yeah, well, DUH!” or “Of course it is”. I had rather suspected that the answer was right under my nose all along so the lack of surprise is OK with me. It’s much better than active disagreement! The greater value has been in finding out what is NOT my Why. This clarity gives me greater confidence and purposefulness, removing the confusion and doubt that leads to half-hearted, equivocal and inconsistent actions. Sometimes it is not what we discover that is important but what we discard. By removing the noise and clutter of my ‘Hows’ and ‘Whats’, I have created a clear and simple picture of what matters – my Why. In short, I have got out of my own way. I do a lot of this sort of work with my clients, untangling their thoughts and discarding what doesn’t matter, paring everything down to the simplest statements to get clarity. This is essential work but you just can’t do it by yourself and therefore, as well as using the course, I had a buddy to help me work it through. So a big shout-out is due to the original Kiwi Girl Lena Robinson for her skill, patience and general forbearance. Oh, and what’s my Why, you say? Well, I’m not going to share that right now because I want to road-test it for a while so I can play around with the words and get comfortable with it. But for those who know me, it’s obvious, isn’t it? This entry was posted in Uncategorized and tagged Coaching, Re-invention, Values. Bookmark the permalink. Post a comment or leave a trackback: Trackback URL.